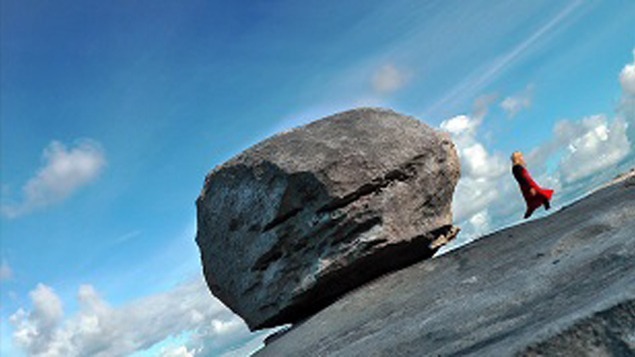 Within a Stone’s Throw is a video installation that considers the connections between landscape and the human presence, exploring unconventional perceptions of reality, scale and time. Artist Cecelia Condit transports viewers to Ireland’s Burren Coast, a magical place where megalithic tombs, prehistoric burial mounds, Bronze and Iron Age forts, and medieval castles stud the rocky, wildflower-strewn terrain. Appearing variously as a girl, young adult, and older woman in the video, the artist as actor surveys the dramatic landscape, her movements and the video’s time/space shifts alluding to the unfolding of human and geologic time.